Are you tired of missing your prey just because the pair of binoculars you own has low quality optics? Well, you probably want to invest in a high quality pair such as the Vortex Optics Viper HD Roof Prism Binocular and for good reason. 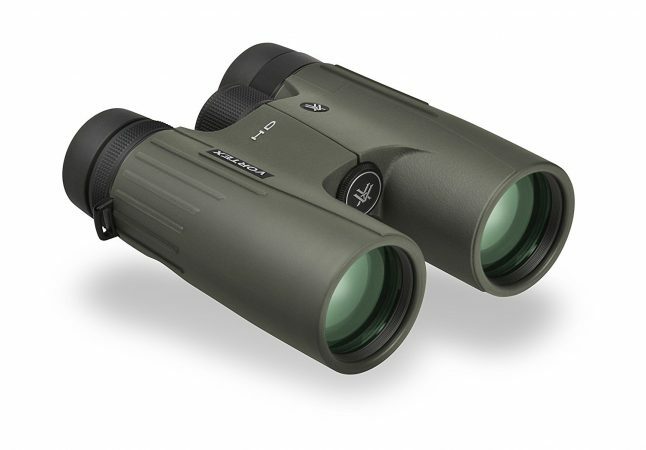 As an HD pair of binoculars, the low dispersion glass lenses tend to exhibit minimal chromatic aberration, meaning you won’t get the usual blurring of color edges, which make images fuzzy. In a nutshell, this pair operates in exceptional fashion more so in low light conditions. While some of the difference it makes can be attributed to its HD engineering, the overall build and design also play a lead role in making this binocular one of the best in the game. Below, we take an in-depth look at the Vortex Viper HD 10 x42 pair and whether or not it’s worth your investment. Enjoy! The one thing that distinguishes the Viper from chuff is its ability to offer consistent, dependable performance in all scenarios, terrains and weather. Its durable construction also doesn’t hurt. Here are some of the features to expect. 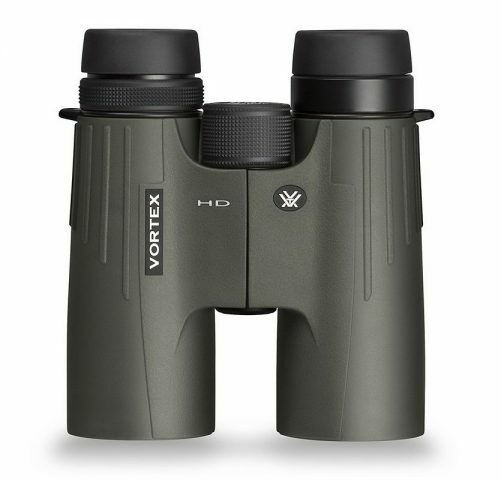 While the rubber armoring does a great job at preventing moisture from getting into your binocular, the Vortex Optics Viper HD Roof Prism Binocular is both internally fog-proof and waterproof. Sure, the exterior lenses will still get fogged if used in cold or humid environments, but when it comes to the interior where the humid air has been purged and replaced with argon gas, you can bet that there won’t be any moisture to fog your optics. The effective O-rings in particular, serve as the main reason behind its impeccable waterproof abilities, working at keeping the interior fog-free and dry at all times. With this, you don’t have to worry about moisture-fed fungi thriving on the binoculars’ interior lenses as is usually the case with most products. It is quite impressive how it only takes 1.5 turns for the central focus knob to go from close focus to infinity – a huge pro for avid hunters with limited time to pinpoint their prey. If you’ve used binoculars requiring extended periods of changing focus, you’ll likely have great appreciation for this fast focus pair. In a nutshell, any hunter will tell you that the greater the adjustment time, the more daunting it gets after an entire day of changing focal ranges. 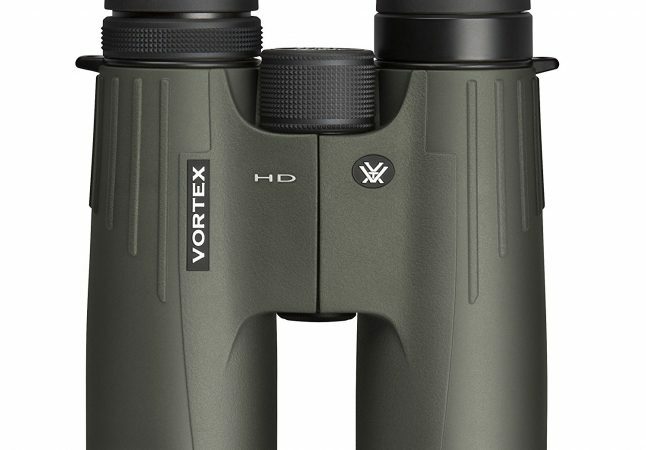 As is expected, the comprehensive focusing of the Vortex Optics Viper HD Roof Prism Binocular is as smooth as melted butter, meaning it is safe to rank it above average. It won’t leave you feeling fatigued or strained after your hunting trip. Also worth a mention is the high quality polycarbonate chassis that facilitates its lightweight features despite the somewhat hefty weight of the lenses. Generally, polycarbonate is a sturdy plastic material used to offer great durability while maintaining light weights. At a total weight of 697g, this pair is clearly lighter than most of the competition. It’s also shorter and to some extent, resembles a short-barreled binocular. The thumb indents located on the bottom side of the viper barrel are innovatively designed to facilitate equal lens weight and length distribution. This means you don’t have to worry about having fatigued arms at the end of your hunting expedition – a norm with most imbalanced binoculars. The grip is also extremely comfortable, with ergonomic hands that perfectly place the index fingers right above the focusing wheels without even trying. Avid hunters or wildlife observes will attest to the importance of this feature. While the Vortex Optics Viper HD Roof Prism Binocular sport hard rubber armoring to facilitate firm grips regardless of weather conditions, always keep in mind that this won’t prevent the lenses from getting damaged if it drops or get knocks from trees or rocks. One of the most innovative features of the Vortex Optics Viper HD is its adjustable eyecups that twist up and down – any instrument offering options is always worth the investment. The eyecup design allows you to extend the Viper in three simplistic, 3mm steps with a categorical stop at each level. The process is extremely user-friendly, meaning you shouldn’t have issues slipping down a step if need arises. Overall, you get a nifty 16.5mm eye relief to facilitate greater optimized and personalized viewing experiences. Great image clarity even in low light conditions. Reliable performance in all environments thanks to high-quality optics. Comes with all necessary tools required to take care of the Vortex Viper Binoculars. Specially designed lenses intended at offering high-resolution images and better color displays. 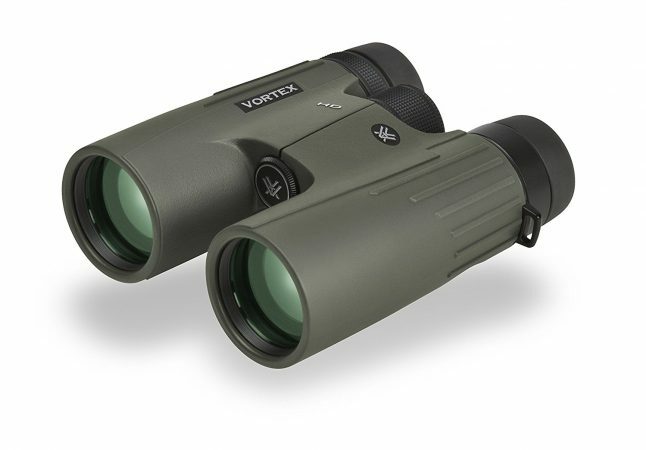 Lifetime warranty with every purchase of the Vortex Viper Optics binoculars. Dirt or debris caught up in the eye ring can greatly affect your field of vision. However, such problems can be easily solved using the lifetime warranty. Well-placed O-ring seals to keep moisture, dirt and debris at bay. This enhances the instrument’s performance in all weather conditions regardless of environment. HD extra-low dispersion glass delivers exceptional color fidelity and high-quality image resolution. XR multi-coated air-to-glass surfaces to enhance light transmission. Dielectric prism coatings also deliver color accurate, clear images that are really bright. Q. Does the Vortex Viper Optics binoculars come with warranty? A. Yes. Upon purchase of every pair, you get a lifetime warranty that allows you to take it back for repair or replacement if any issues arise. Q. What’s in the box? A. Besides the binoculars, you get a comfortable neck strap, rain guard, innovatively tethered objective lens covers and a premium carrying case. This is not to mention the unconditional VIP lifetime warranty listed above. As you can gather from the above, the Vortex Optics Viper HD Roof Prism Binocular is a high-performance pair of binoculars that allow hunters to get the most out of every expedition. The best part is, they won’t leave you feeling fatigued regardless of how long you use them thanks to exceptional eye relief technology, great weight and length distribution and perfect balancing. They come with a sturdy frame and well-placed O-rings that not only enhance durability, but also make it fog and waterproof. Generally speaking, every feature entailed in the Viper is designed to offer impressive HD images that can be defined as surreal. For instance, the well-built glass lenses sport the ability to increase light transmission meaning you can bet on it to remain effective even in low light conditions. It will remain effective whether you go early morning hunting or catching games while foraging. Check out the list of 6 Best Binoculars for Hunting!